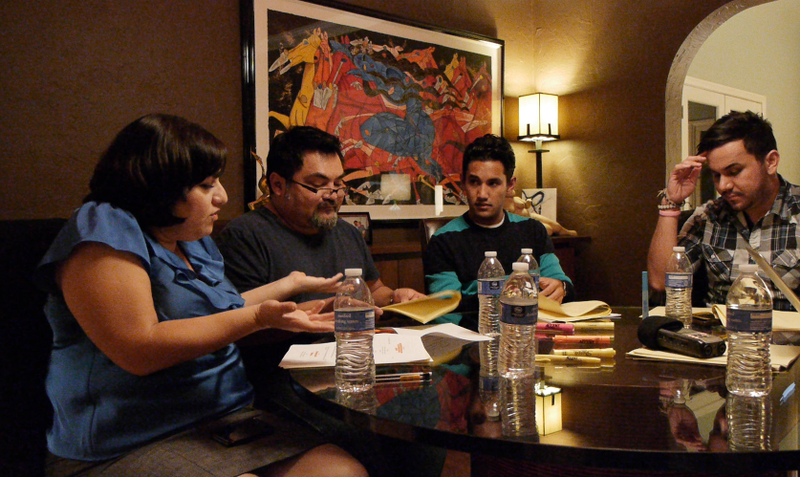 A talented cast and crew embarked on a table reading for The Baby Cries. The Baby Cries is a short film comedy based on a stage play I wrote for CASA 0101's The Brown and Out Theater Festival this year. It is a story of a gay couple raising their newborn daughter and the chaos that ensues when the traditional Catholic Salvadoran grandparents show up. The talented Cast includes: Martin Morales, Miriam Peniche, Matt Pascua and MJ Silva. As the writer/producer/director of the film, it is a proud moment to see the "baby" come alive. The play version generated a lot interest and praise from the audience, and it was great to hear how well people connected to the story. Time and time again people would tell me how they identified with each character - people from all walks of life: gay, straight, male and female. When writing the piece, there was a part of me that wanted the characters to be identifiable with anyone and people did indeed connect to the story of family, tradition and the insecurities of raising a family. At the table read we discussed story, character motivation, speech and dialogue. The cast is invested in portraying their character with a finite sense of honesty, and as a director I could't be happier. Martin, Miriam, Matt and MJ came into the reading wanting to know more and how best to emote for camera. When you have a cast engaged in the process you realize how deep their own motivations are as actors. How could a director not love working with actors? In the next few weeks we'll undertake on make up and camera tests that will lead us to our day of production. For now, the actors will have to prepare for their roles for the camera, awaiting the day "action" is called.